Over the last little while a lot has happened. First, last week the front of the car got straightened. 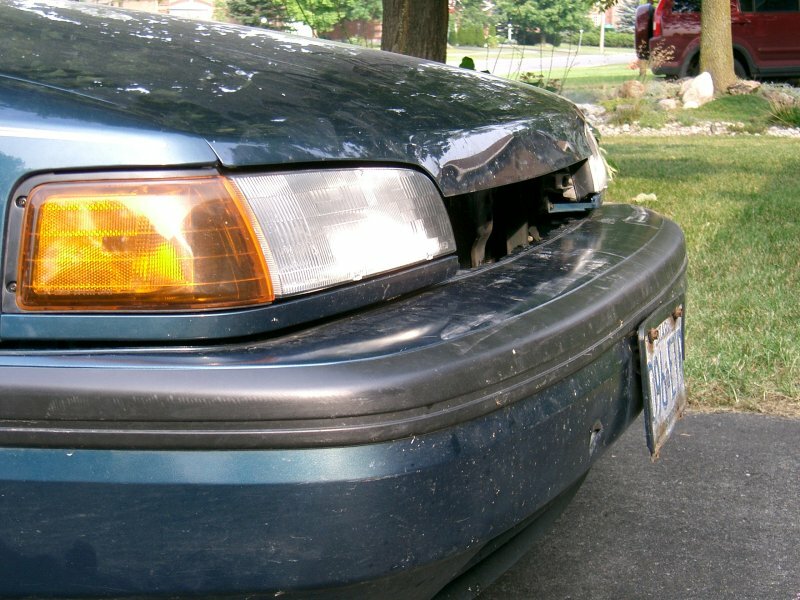 The hood and bumper still look rough, and there is no grille, but the underlying structure is as straight as it can be. Additionally, the hood sits flat. I also managed to get a lot done on the driver-side door patchwork over the weekend. It's amazing how much traffic my Celestia announcement to gnomedesktop.org generated. On Thursday alone, there were 970 visits, which accounted for 20541 hits, and over a gigabyte of traffic. The weekend was largely spent doing very little. It's my last free weekend before school starts. I spent most of it catching up on bill payments, organizing financial records, cleaning out eMail, planning my new computer, etcetera. On the subject of bill payments, I paid tuition today, now that I have my baroque music elective approved. It came to $6149. It did not go up from last year. After having my fourth year project idea rejected by the professor last week for being too complicated as a one-person task, I've been getting increasingly worried, as time is running out. Then, yesterday, it hit me: earlier in the year I was hypothesizing about how the X-box would make for a decent in-car computer. So I fired off an eMail to another prof asking if he would supervise that. If he does not, I will find someone who will, because this project has good potential. The X-box already runs Linux, and there are already good programs designed for car use. The project would be to integrate and extend. I intend to get this out of the way soon. Funny story of the week: in this house, we often have alcoholic beverages using Coke as the base. with drinks like that the kids aren't left out because the just get the same thing minus the alcohol. Well, yesterday evening my dad screwed up: he accidentally took the non-alcoholic drink for himself and gave my little brother the one full of gin. He didn't notice this as he got distracted playing some computer game. My brother got quite drunk and it was very funny. The poor kid couldn't stand. End of story.